Since its beginning in 2010, Instagram is truly a social network to be reckoned with. The mobile-friendly app boasts an incredible 300 million users and 70 million daily posts. While it’s most commonly used for personal social networking, Instagram can be a great tool for businesses to market their brand and products. The first step to creating a strong Instagram following is to identify your cookie-cutter customer, and attempt to relate through your pictures and captions. 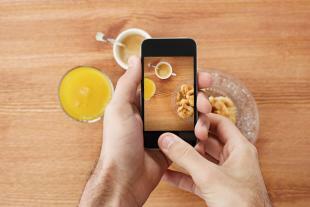 This rule does not necessarily mean merely posting pictures of things you believe your customers love and enjoy. The best way to relate to your customers is to posts pictures of things they will enjoy that can also relate back to your brand and product. This concept will help to create a following of customers who share common interests. One of the potentially best ways to market your product and brand is the proper and deliberate use of hashtags. Hashtags are a great method to create a community or following of people behind a few buzzwords. On OpenSesame’s official Instagram, @opensesamenow, we create and add to the elearning community through our Instagram posts and hashtags. By hashtagging #elearning, we add to a community of those interested in elearning on social media. It’s a great way to put your foot in the door whether you are a B2C or B2B business. Even if you are a B2B business, and your product itself is not aesthetically pleasing, there is certainly beauty in your brand. All you have to do is find it! Instagram is a great way to market this beauty, especially through photography. It’s easy enough to simply post and caption pictures, but it takes another level of skill and creativity to use the filters and photo effects to your advantage from a marketing standpoint. When posting pictures, don’t forget to employ your creative side and use filters to increase the excitement and engagement of your Instagram post. After utilizing the above suggestions to create beautiful and well-done content, you’ll still need to create a following of viewers and customers willing to comment and like on the posts you make. The easiest way to do that is essentially treat other accounts the way you want your account to be treated. Begin by following other Instagram accounts similar to your own, and like and comment on their posts. You will soon find that the combination of posting and interacting with other posts begins to create a larger and larger following for you. Follow these tips and trick to gain some serious traction in the ever-growing world of Instagram. It’s truly a great place to market your product creatively.